For people who have to deal with ADHD on a daily basis, finding ways to cope with the symptoms and challenges remains a top priority. One approach is far from new but it is only recently that we have discovered the benefits in people who struggle with ADHD. A study led by a number of scientists and physicians found that simple meditation practices could reduce stress and anxiety by more than half. On top of that, participants in the study also experienced a significant reduction in ADHD symptoms. The study primarily focused on young people with ADHD – students. The students in the study used a special kind of meditation technique known as transcendental meditation. This kind of meditation helped students to enhance their academic learning and ‘executive’ – or higher level – brain functioning. At the same time, symptoms of ADHD decreased as well as learning disorders, anxiety, mood disorders and even other health conditions. Even more benefits were seen in working memory and the ability of students to organise their work. They had improved their ability to regulate their behaviours and manage stress and had better attention spans too. Researchers already knew that stress can interfere with learning, particularly so in students who suffer from ADHD. In a sense, stress shuts the brain down to some extent. Also, medication is not effective in everyone, which drives the need to find more effective treatments for ADHD sufferers. Even those who experience improvement with medication may need additional options to add to their regimen. Interestingly enough, transcendental meditation has shown success in the general population as well. Here, it helps cognitive functioning and reduces anxiety. It is one reason that physicians and scientists were keen to see its effects in students who suffer from ADHD. 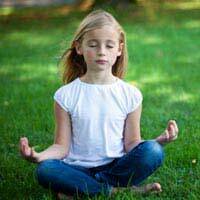 Another positive aspect to this kind of meditation is that the study was done on children. Researchers feel confident that if children can learn the technique quite easily – as shown in the study – then it holds promise in further investigations on adults as well. It may be of benefit to concentration and lowered stress in environments such as the workplace. The benefits reached further in terms of the teachers’ response. Teachers reported that they were able to teach better and that students were more responsive. Researchers think that this is due to the students being significantly less stressed and suffering from less anxiety due to their ADHD. Previous studies have suggested that students who have ADHD experience slower brain development and they also struggle more to cope with anxiety and stress in their environment. This recent research is particularly promising because it addresses an important need in helping ADHD students. Generally, meditation does not have any ill effects, which contrasts to the long list of side-effects seen in prescription medications. While prescription medicines certainly have benefits and serve their function, many people with ADHD prefer alternative approaches such as meditation.